I am thrilled with the finished product. I took off the ring I was wearing at the office today and put on this beautiful creation. Margo was a dream to work with. She kept me updated every step of the way. I will definitely be purchasing more jewelry from her again. 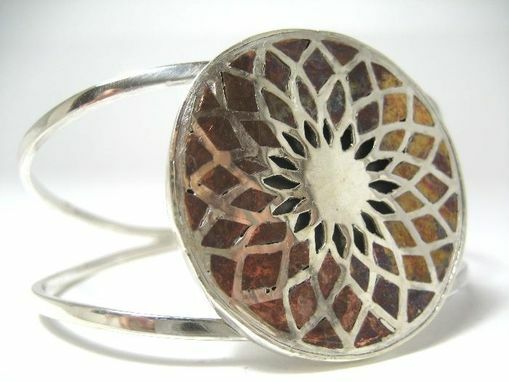 This piece is a cuff made from sterling silver. The design is a silver plate with a dream catcher design pierced into it. Copper is inlaid into the plate. The plate was then bezel set. The circle is about 1.5" in diameter. Every maker has a story. Be a part of Margalita Designs's story by placing an order, leaving a review, and seeing your review appear here.